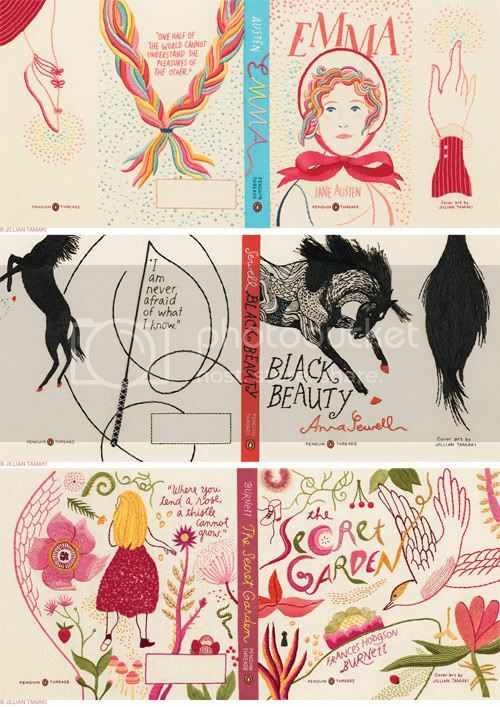 These have been blogged a few times already but I had to throw my opinion into the ring because I was so blown away when I saw a link to these embroidered book jackets by Penguin, as created by illustrator and cartoonist Jillian Tamaki. Freshly Blended shared these in her Flickr stream and my heart started to race. I am a lady obsessed with detail, and although the copies we purchase will not be embroidered like the original for obvious reasons, the point is that these are very special jackets in that they were created by hand before turning them into a book cover and owning one supports those who are commissioned to do such work for large companies -- at least in my opinion. I love seeing these types of collaborations. I also like that Jillian shares her process on her blog right here with some "in progress" photos - something I always love to see. What do you think of these jackets, are you also dying to order them? Liberty Styling Demo: I'm off to London!